Design to your vision ─ Protean’s aluminum plate panels expand your creative possibilities. Flexible and versatile, Protean’s aluminum plate rainscreen and barrier wall systems are well suited to small projects with custom colors. The panels are painted after they are formed, eliminating the cost of minimum orders for custom ACM or coil coated colors. These systems work well for civic, education and government buildings as well as for retail/commercial canopies and entrances, where durability is necessary and long life is desired. 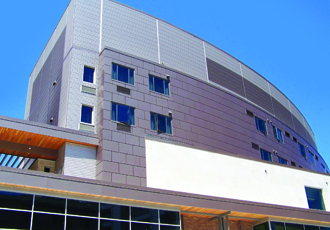 Ranging from a pressure equalized rainscreen system, to a fully caulked barrier wall system or decorative perforated coverings ─ standard construction is with 0.125″ plate, ideal for cladding applications that go down to grade or as an accent around an entrance. The panel thickness prevents denting common to thinner rainscreens or ACM panels, and eliminates the possibility of delamination. All of our standard products come with a Twenty Year Finish & Five Year Workmanship & Durability Guarantee. 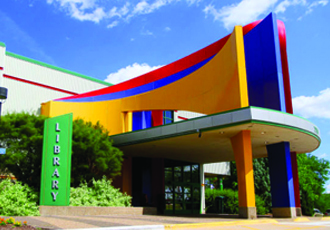 The Bettendorf Public Library (link to case study) features a bright multicolored entrance that flares open like a book. To achieve the architect’s vision, significant contouring was needed along with durability for a high traffic area. Protean’s AP-1125 aluminum plate panels were the ideal choice enabling contours on varying planes and durability to hold complex shapes for a curved aesthetic. As true rainscreens, the AP-2500RS and AP-2000RS offer the ultimate in lowest overall cost throughout the service life of the system. Back ventilated and drained rainscreen systems (the AP-2500RS and AP-2000RS) adjust to pressures within a 0.8 second differential. They can also meet LEED requirements due to the elimination of thermal bridging and 100% recyclable content. The new AP-2500RS installs up to 40% faster than spline joint systems due to integrated drainage channels and attachment clips. Engineered for extremely wet climates or for buildings exposed to driving rain, AP-3000RS rainscreen systems feature an open joint system. AP-3000RS is designed to reduce the risk of moisture seeping behind the panels due to joint splines not found in more economical rainscreen systems. The extruded frame and non-welded corners provide a crisp and clean edge for an improved aesthetic. Ideal for projects with multiple bends, shapes and contours on varying planes, AP-1125’s durable material holds complex shapes enabling a curved or sloped aesthetic. The base design is also ideal for construction of perforated panels, which allows solid plate and perforated panels to be easily blended in the same project. AP-2125 systems are designed to be free-floating through the use of stainless steel alignment pins for seismic considerations. 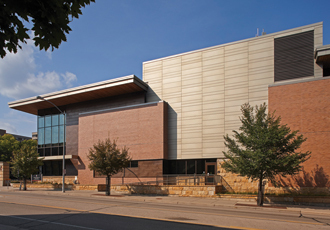 UW Madison Union South features Protean’s AP-2000RS aluminum plate panels, well suited for large projects requiring low maintenance, sustainability and longevity. The facility received LEED Gold Certification for sustainability and environmental design. The Gordon Event Center at UW Madison houses numerous restaurants, a formal dining room, and a spacious event space for UW students and faculty. Protean AP-3000RS provided a crisp aesthetic on long horizontal panels. The University also appreciated the fact that these panels require minimal maintenance on upper elevations through the long life of the building while meeting demanding sustainability requirements. 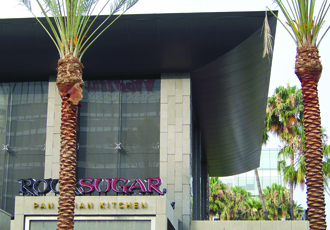 The Rock Sugar Pan Asian Kitchen, designed with complex contours, needed curved panels with mitered corners made possible by Protean’s AP-1125 aluminum plate panels..